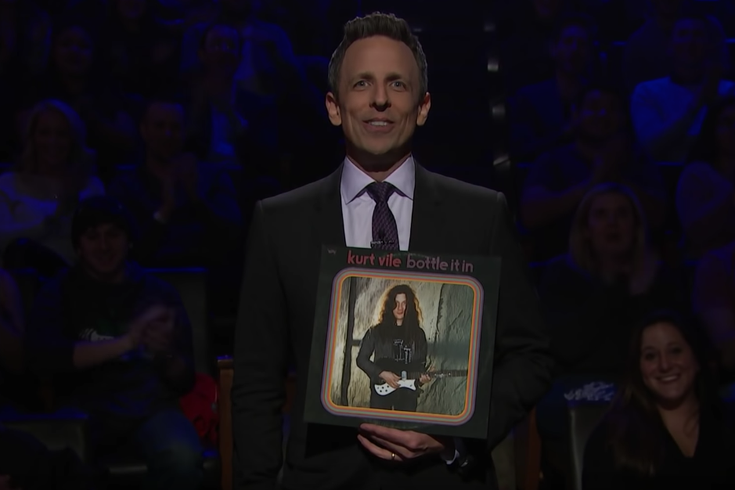 Kurt Vile perfoms "Yeah Bones" on "Late Night with Seth Meyers." From his latest record, "Bottle It In," Philly rocker Kurt Vile returned to “Late Night With Seth Meyers” on Tuesday to perform a deep cut off the record, “Yeah Bones.” Catch the performance below. Vile recently performed a set for NPR’s “Tiny Desk Concert.” With his music mate, Robert Laasko at his side on guitar, he performs two singles off his newest album, “Bassackwards" and “Loading Zones" and tacks on a track from his collaboration with Courtney Bartnett, “Peeping Tomboy" from their album, "Lotta Sea Lice." His newest single “Timing is Everything (And I’m Falling Behind)” was dropped this January as a standalone single for Amazon Originals. Vile kicks off his world tour later this month.